There are two pretty awesome feelings in this world. One – the warm feeling of having a belly full of delicious craft beer on St. Patrick’s Day and two – the tingly feeling you get when you help those in need. At Wolf Branch, we believe in not only serving delicious beer to our patrons, but also being a charitable patron of the communities we serve. 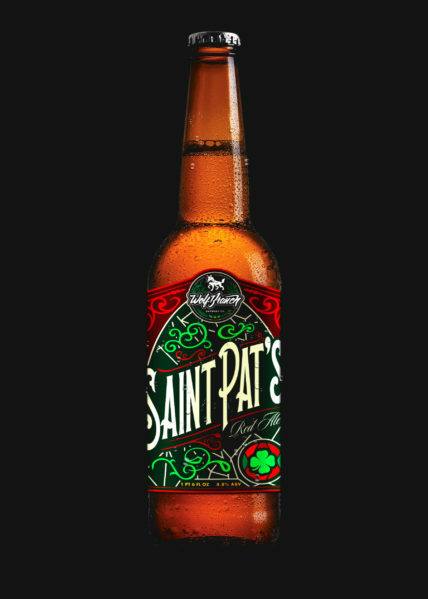 A portion of each sale of St. Pat’s Red goes directly to charity, so cheers to supporting a good cause! While St. Patrick’s Day only comes one day a year, we decided to make this red ale available year-round because hey, giving feels pretty dang good. A highly drinkable ale, with a ruby-like hue, expertly balanced with specialty European malts and fine American hops. This special brew boasts a medium to low alcohol content at 4.6% ABV and pleasant bitterness at 18 IBUs.